Get better handling and reduce wheel hop on your 2015-2018 Mustang with a Steeda IRS subframe support brace! Start by lifting the car via a lift or jack and jackstands. Make sure the jackstands or lift arms are out of the way of the subframe and the rear portion of the pinchweld. Remove the rearward 15mm bolt and set it aside as it will be reused. Position one of the braces into place and loosely tighten the previously removed bolt. Install one of the supplied M10 35mm Hex Head bolts into the now, rearward bolt hole but do not fully tighten. Install one of the supplied M10 50mm Hex Head bolts into the IRS cradle support but do not fully tighten. Slide the supplied threaded plate into the square opening in the IRS cradle. Place one of the included washers over one of the supplied short allen head bolts. Thread the bolt into the plate but do not fully tighten. Place one of the included washers over one of the supplied long allen head bolts. Slide one of the included nuts through the cradle and loosely bolt the two together. Fully torque the hardware to specs (Allen Head Bolts - 55 lb/ft, Hex Head Bolts - 45 lb/ft). Complete the process for the other side and you are finished! Check out our YouTube channel for even more tech tips, installation videos, how-tos, and more. The best place to go for anything Mustang related! Bolt on better handling, reduced wheel hop and quality with Steeda's 2015-2018 Mustang IRS subframe support brace kit! This kit is not permanent and will stiffen up the subframe of your IRS for better handling and a more stable ride in the corners. By limiting the movement of the IRS subframe with connection points at the front as well as the lower control arm and toe link, this reduces wheel hop along with the added strength. This kit is constructed of high quality 4130 chrome moly steel for strength and durability. This high quality steel is the powder coated in a silver metal flake that will look great under your Mustang. These quality materials have a lifetime warranty for peace of mind. - These IRS braces are not compatible with BMR jacking rail BMR-CJR001R and BMR-CJ001H. - These are compatible with jacking rail ST-5555205. How’s it going everybody? Landan here with LMR.com! In this video I’ll be taking a quick look at Steeda’s IRS subframe support braces and why you need them for your S550 Mustang. First things first here guys, these support braces feature Steeda’s exceptional quality and craftsmanship, and the attention to detail is second to none. These IRS subframe support braces are designed to increase chassis rigidity by bracing the uni-body with the IRS subframe. This is drastically going to increase handling, reduce the awful wheel hop that plagues the S550 cars and of course will limit the movement of the IRS itself. Steeda manufactures these braces from 4130 chrome moly steel because of its lightweight characteristics. They are then powdercoated in a silver finish to offer years of durability from the elements. These particular support braces will work with the fastback model only and not the convertible. Also, any of you currently running or plan to install a set of Steeda jacking rails in the future; these support braces are compatible with those as well. On the subject of compatibility, they are not compatible with the full length BMR and J&M jacking rails. In the box will be two support braces, installation hardware, and of course instructions. 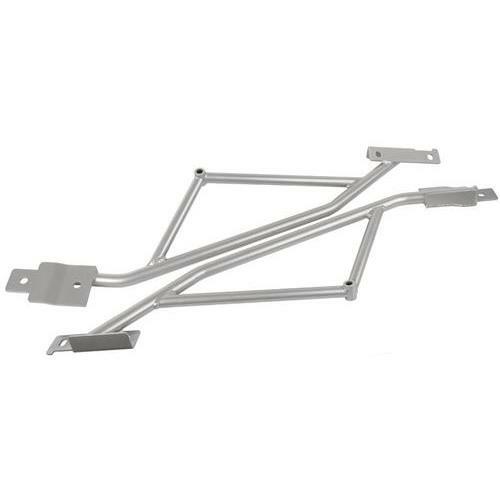 To install these support braces into your Mustang, start off by supporting the vehicle via a lift or jack stands. Make sure the lift arms and jack stands are free and clear of the IRS subframe and rear pinch weld. Remove the rearward 15mm bolt and set it aside to be reused. Position one of the braces into place. No worries on getting these wrong, they will only install one way. Reinstall the factory bolt and do not fully tighten. Install one of the M10-35mm hex head bolts into the now rearward bolt hole, and do not fully tighten. Install one of the M10-50mm hex head bolts into the IRS cradle support and do not fully tighten. Slide the threaded plate through the small square opening in the IRS cradle. Place one of the provided washers over one of the short Allen head bolts. Thread the bolt into the plate and do not fully tighten. Place another washer over one of the long Allen head bolts and slide it through the cradle. Thread the provided locking nut onto the long Allen bolt. Use an 18mm open end wrench to hold the nut and loosely tighten the hardware. Repeat these steps for the other side. Now, go ahead and fully torque all of the hardware to spec. The Allen bolts will be torqued to 55 lb-ft and the hex head bolts will be torqued to 45 lb-ft. Double check your work, and you’re all finished. All in all here guys, this install is very straightforward. I would recommend picking up a 10mm Allen socket for your three-eighths drive ratchet to make things easy. Other than that, jack stand placement is key since these install near a support point. Total installation time is probably somewhere in the neighborhood of an hour and a half. To see more videos covering Steeda products for your S550 Mustang, be sure and subscribe to our YouTube channel. These Steeda IRS support braces are currently available over at LMR.com! 5.0Resto, SVE, LMR are registered trademarks of Latemodel Restoration Supply, Inc. Ford, Ford Lightning, SVT, Special Vehicle Team, F-Series, F150, Triton and all representations are trademarks of the Ford Motor Company. Eaton is a trademark of the Eaton Corporation. Ford, Ford Mustang, Mach 1 Mustang, Shelby GT 500, 5.0 Mustang, Cobra R, Fox Body Mustang, SVT Cobra, Bullitt Mustang, Mustang Cobra, Mustang GT, V6 Mustang, S197, SN95 are all registered trademarks of Ford Motor Company. Saleen is a registered trademark of Saleen Incorporated. Roush is a registered trademark of Roush Enterprises Inc. Late Model Restoration has no affiliation with Ford Motor Company, Roush Enterprises, or Saleen. Any usage or mentions of these terms throughout our website and print ads are used for identification purposes only.